The Gemco 952 BlueOx Series Linear Displacement Transducer (LDT) is a linear position sensor designed for applications where high accuracy, high speed, and survival are important. It is lab tested and field proven to stand up to high shock and vibration. With test results of 2,000 G's of shock and 30 G's of random vibration without false signals or mechanical damage, the BlueOx is ready to perform on the most demanding applications. 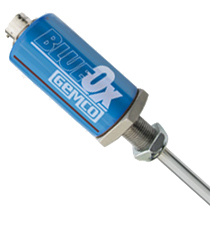 The BlueOx is an ideal cylinder position sensor with absolute feedback. • Sensor Length up to 168"
952A BlueOx LDT (Analog) is an accurate, programmable zero & span, non-contact linear position sensor in a rod-style package. The sensor utilizes our field-proven Magnetostrictive technology to give absolute position, accurate to 0.05% of the programmable sensing distance. A variety of analog voltage and current outputs are available. Our Analog units offer programmable Zero & Span points; the analog output is programmable over the entire active stroke length. Units can be ordered in span lengths from 4” to 168”. 952D BlueOx LDT (Digital) is an accurate, non-contact linear position sensor in a rod-style package. The sensor utilizes our field-proven Magnetostrictive technology to give absolute position, accurate to 0.05% of the sensing distance. A variety of digital outputs are available (Start/Stop, PWM & Control Pulse). Units can be ordered in span lengths from 4” to 168”. 952QD BlueOx LDT (Quadrature) is an accurate, non-contact linear position sensor in a rod-style package. The sensor utilizes our field-proven Magnetostrictive technology to give absolute position, accurate to 0.05% of the sensing distance. The quadrature output makes it possible for customers to have a direct interface to virtually any incremental encoder input or counter card, eliminating costly absolute encoder converters and special PLC interface modules. Units can be ordered in span lengths from 4” to 168”.